In 2016, I saw a Facebook post titled “Rabbit in urgent need of home - Massachusetts”. The post included photos of an emaciated, fawn-colored, big-eared bunny. For the rest of the day, I rechecked the post several times hoping that someone would say or do something to help such a frail-looking rabbit that was clearly in need of a loving home… but there wasn’t a single comment - nothing. And so began our adventure with Penelope – our Big-Eared Bun! 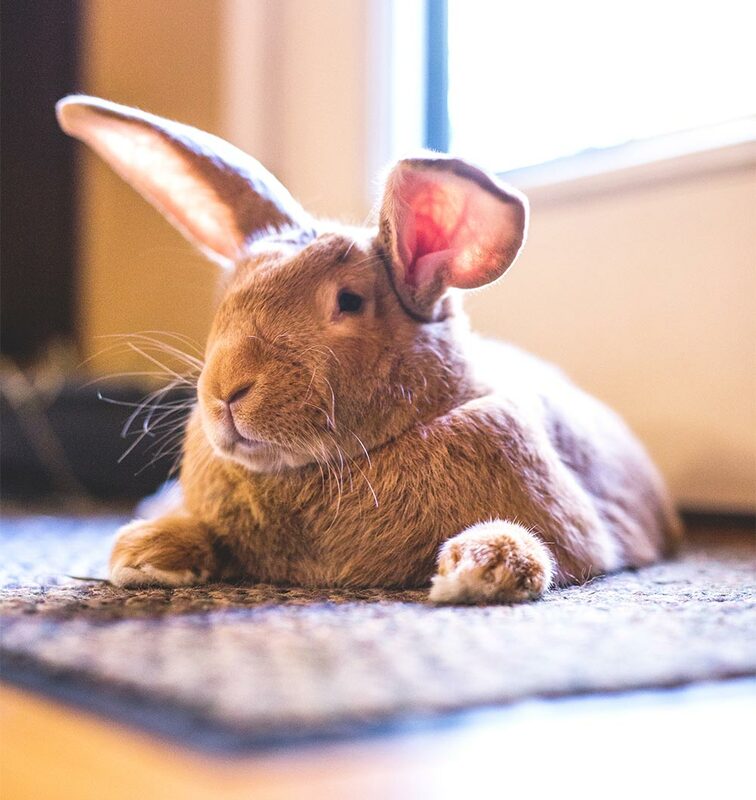 When we got her home, we discovered our new six-pound addition to the family was a four-month-old Flemish Giant. Despite the excitement of having her home, frustration quickly followed after her initially well-learned litter box habits quickly turned into a peeing-on-the-furniture nightmare. On a daily basis, Penelope was peeing on our couch (as well as in her litter box), causing me to buy a couch cover as a deterrent – but this didn’t really help. Although the cover saved our couch from getting ruined, it became an inconvenience as I had to change it, wash it, and replace it several times a day. A short time later, my friend Avril Dufresne, who had worked for many years in the veterinary field, began to take an interest in our new rabbit and asked if she could stop by for a visit. Avril and I had met through a Facebook group for rabbit owners – The New England House Rabbit Group. When Avril came to see Penelope, I offered her a box of old flannel sheets because I knew Avril was an avid sewer who might like to use the material for one of her craft-making projects. We didn’t know it at the time but when Avril gladly accepted the flannel material and offered to “Make a pee pad for your couch…”, this was the moment that would lead to the launch of The Original Penelopads. Once the pad was made, and we put it on the couch for Penelope, she loved the softness of the flannel and was immediately drawn to the pad for lounging, leading us to coin the phrase: “Tail tested – Penelope approved”. And when she peed on it (and she did), it was easy to remove it and replace it with another clean pad, which was much less complicated than removing and cleaning an entire couch cover. Over time, Penelope’s accidents became less frequent, and she has since relegated her Penelopad as a place of soft comfort. She still uses it frequently to stretch out her paws, groom herself, and take naps. Subscribe to our newsletter and be the first to know about updates from Penelopads! Due to the customization of our Pads all sales are final. We want our customers to be 100% satisfied with their purchase. Please feel free to contact us at anytime. Penelopads is not responsible for lost or stolen packages left by postal services.